Luxembourg Garden is a 4-minute walk from the hotel. Cardinal Lemoine Metro Station is 650 metres away. Metro 'Cardinal Lemoine' or 'Cluny Sorbonne', RER 'Luxembourg', public parking close by, bus 89. As part of our continual drive to improve the hotel and make your stay with us as pleasant as possible, please be advised that cleaning of the facade will begin on 15th November and continue until 29th February 2008. We will obviously do our utmost to avoid any inconvenience to you, and would like to thank you for your understanding. All rooms are air-conditioned and feature satellite TV and a private bathroom with a spacious shower. They have a classic French décor. Extras in the superior rooms include views of the Panthéon. 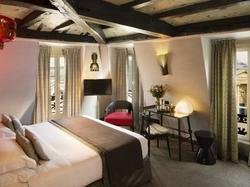 With a view of the Pantheon, this room features a minibar, air conditioning and satellite TV. A Nespresso coffee machine is provided and the bathroom is complete with a bathtub. On your day of arrival, you?ll find a half-bottle of champagne in your room, together with a box of chocolates and a rose petals spread across the floor.